Syracuse University will celebrate Mayfest 2013 on Friday, April 26, from 1-6 p.m. in Walnut Park, adjacent to the SU campus. Mayfest marks the arrival of spring and the end of the school year with live entertainment, prizes and free food and drink. The entertainment for Mayfest kicks off at 1 p.m. Rapper Earl Sweatshirt will headline Mayfest. Sound Remedy will open the show, with a middle act to be announced at a later date. This popular SU/SUNY-ESF students-only tradition is co-produced by the SU Student Association and University Union in partnership with SU and the City of Syracuse. Mayfest will take place rain or shine. Valid current SU and SUNY-ESF student I.D. cards are required for entry into the park. Entry into Mayfest is free for all SU and SUNY-ESF undergraduate students with a valid student I.D. In addition, SU and SUNY-ESF undergraduate students are able to purchase with their student I.D. one ticket for a guest who is a current undergraduate student at another institution or an active military member. A limited number of guest tickets are available beginning Monday, April 8, at the Schine Box Office for $21.50 each. SU and SUNY-ESF graduate students and College of Law students will need to purchase a ticket to Mayfest for $21.50. A limited number will be available for sale at the Schine Box Office beginning Monday, April 8. All tickets include food, beverages, music entertainment and beer (if the student is at least 21 years old with a valid, state or government-issued I.D.) Ticket sales will end at 4 p.m. on Friday, April 26, or earlier in the event the tickets sell out. Tickets can only be purchased by SU or SUNY-ESF students, with a limit of one ticket per (student) I.D., and both the ticket and a valid college or active military ID will be required for admission to Walnut Park on April 26. 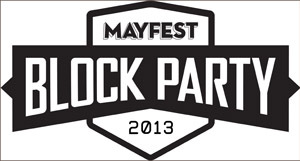 Mayfest leads into University Union’s Block Party 2013, which will take place the same day at the Carrier Dome. Ke$ha will headline the event, which begins at 6:30 p.m. Supporting acts will be announced at a later date. Free food and beverages will be available at Mayfest. A limited amount of beer will be available to students age 21 and over at no charge (proof of age required). A student or guest will need to show proof of age to Chestnut Security staff. If the individual is 21 or older, then the individual will proceed to the next step: presenting a valid SU/SUNY-ESF I.D. to Chestnut Security staff, who will verify the student by swiping the ID card; guests and graduate students will hand in their tickets. The student or guest will then receive a bracelet from an SU administrative staff person. A student or guest arriving before 3 p.m. will be given a bracelet with four tabs that can be exchanged for four beers. A student or guest arriving at 3 p.m. or later will be given a bracelet with two tabs that can be exchanged for two beers. Students and guests can re-enter the beer area if they have a bracelet with tabs remaining on the bracelet. For the safety of students and residents of the University area, throughout the day on Friday, April 26, all city ordinances will be strictly enforced by the Syracuse Police Department in the Walnut Park area and along Euclid Avenue and in the East Neighborhood. Walnut Place parking will be restricted from 5:30 a.m. to 10 p.m. on April 24 to April 26, and will be closed to traffic from 6 a.m. to 8 p.m. on April 26. Walnut Avenue parking will be restricted from 5:30 a.m. to 10 p.m. on April 24 to April 26, and will be closed to traffic from 6 a.m. to 8 p.m. on April 26. Marshall Street parking will be restricted from 6 p.m. April 24 to 8 p.m. on April 26, and will be closed to traffic from 9 a.m. to 7 p.m. on April 26. Marshall Street from Comstock to Walnut will be closed from 9 a.m. to 7 p.m. on April 26; local traffic only will be allowed. East Adams Street from University Avenue to Walnut will be closed to traffic from 9 a.m. to ­ 7 p.m. on April 26. UAG permit holders and visitors will be able to enter the garage from Adams entrance and exit the Harrison side of the garage. Cars within these boundaries will be towed after 6 a.m. on Friday, April 26. Alternate parking will be available in the Manley and Fine lots. Dining note: Due to staffing and food needs for this event, Shaw and Brockway dining halls will close at 2 p.m. on April 26.